"The strongest man doesn't always win, but the smartest one does." Well Go USA has released the official trailer for the action film Kickboxer: Retaliation, which is the sequel to the Kickboxer remake film titled Kickboxer: Vengeance from 2016. Wait - did anyone even see Kickboxer: Vengeance? I recall watching the trailer for it, but I don't recall anyone seeing it or saying much about it, but maybe I forgot. Was it actually good enough to warrant a sequel? Either way, the sequel is done and is in theaters this month. Kickboxer: Retaliation has another fairly impressive cast: Alain Moussi, Christopher Lambert, Jean-Claude Van Damme, Sara Malakul Lane, Hafþór Júlíus Björnsson, Sam Medina, and Mike Tyson. I wish this looked like something I would want to watch, because even the big fights don't seem that good. See below. One year after the events of Kickboxer: Vengeance, Kurt Sloan has vowed never to return to Thailand. However, while gearing up for a MMA title shot, he finds himself sedated and forced back into Thailand, this time in prison. He is there because the ones responsible want him to face a 6'8" 400 lbs. beast named Mongkut and in return for the fight, Kurt will get two million dollars and his freedom back. Kurt at first refuses, in which a bounty is placed on his head as a way to force him to face Mongkut. Kurt soon learns he will have no other choice and will undergo his most rigorous training yet under some unexpected mentors in order to face Mongkut in hopes to regain his freedom. 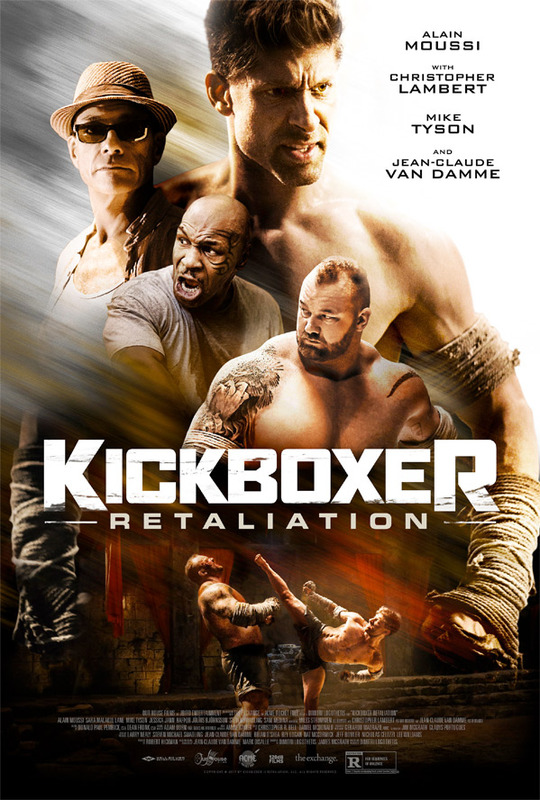 Kickboxer: Retaliation is written and directed by Greek-American filmmaker Dimitri Logothetis, of the films Pretty Smart, Slaughterhouse Rock, The Closer, Body Shot, Hungry for You, Cheyenne, and The Lost Angel previously. Well Go USA will release Kickboxer: Retaliation in theaters starting January 26th, 2018 this month. Is anyone interested?